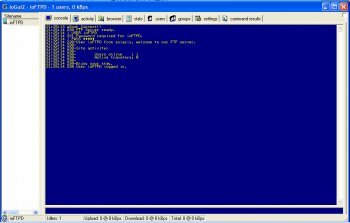 ioFTPD is a professional high performance Ftp Server for Windows. It has a wide range of flexibility through its tcl scripting extension. Features vfs, low resource, detailed user access limitation, siteop, open source, and huge range of user made scripts. It's meant to serve high load private ftp server,works well with terabyte of data and high speed connection backbone.I was tested it against Raidenftpd newest,ioFTPD gain double the speed that i've got on Raidenftpd.ioFTPD really fast but the only minus is there is no good nice GUI like serv-u or RaidenFTPD,to track down wrong configuration you just need to check the log,and if it stay persist,friendly forum user will help you out. This is the best ftp server for windows-based boxes. However in my humble opinion this is not the best choice for home use, where gui is still preferable, simply because why would anyone bother with half-baked gui solutions like the one ioFTPD currently has. So, well, this really IS a #1 server for windows-based boxes, but I would recommend using it for those servers that are managed remotely. For home use I choose RaidenFTPD, which is quite powerful and at the same time got a decent gui, which makes a home server WAY easier to manage.